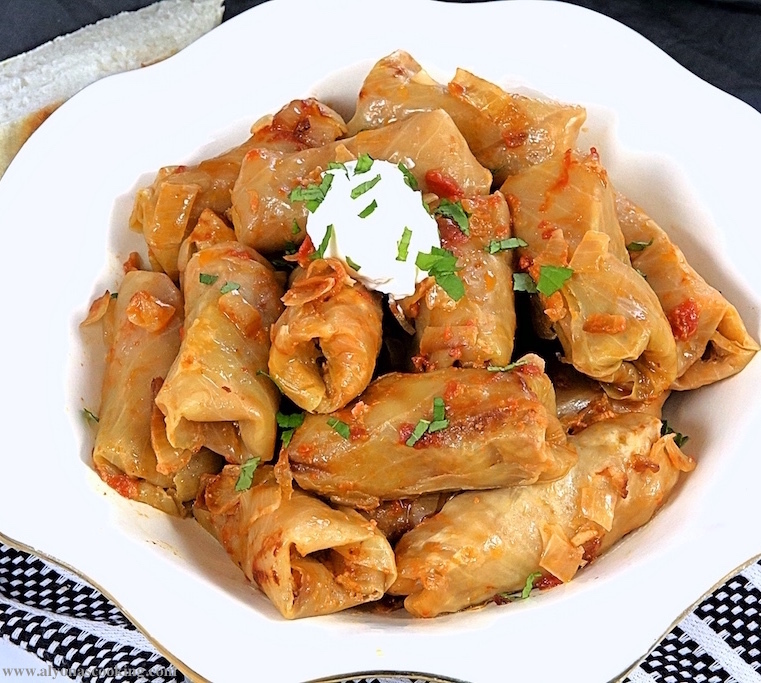 Stuffed Cabbage Rolls is a well-known stuffed cabbage dish in the Slavic culture. Wilted cabbage leaves are stuffed with a meaty rice mixture and baked away to deliciousness. This is my favorite way to make these tasty cabbage rolls. These do take up some time to make but it’s so worth the labor–you’ll have plenty of delicious homemade cabbage rolls. Can’t finish up a batch soon? These can be frozen in a disposable foil dish! Layer up and freeze then just thaw and pour the sauce over the rolls before baking for a future meal! Try this homemade version from scratch. Also, check out my Lazy Cabbage Rolls Recipe (One-Pan Meal) as an easier alternative. Combine rice and 1 1/2 cups of water; bring to a boil, reduce heat to low and cook for 20 minutes. Set aside to cool. Sauté onion and carrots in a few tbsp of oil until nicely browned. Add remaining sauté ingredients and simmer over low heat until well combined. Set aside to cool. In a large bowl combine the meat mixture, sauté mixture, cooked rice, and salt & pepper; mix thoroughly. Set aside. 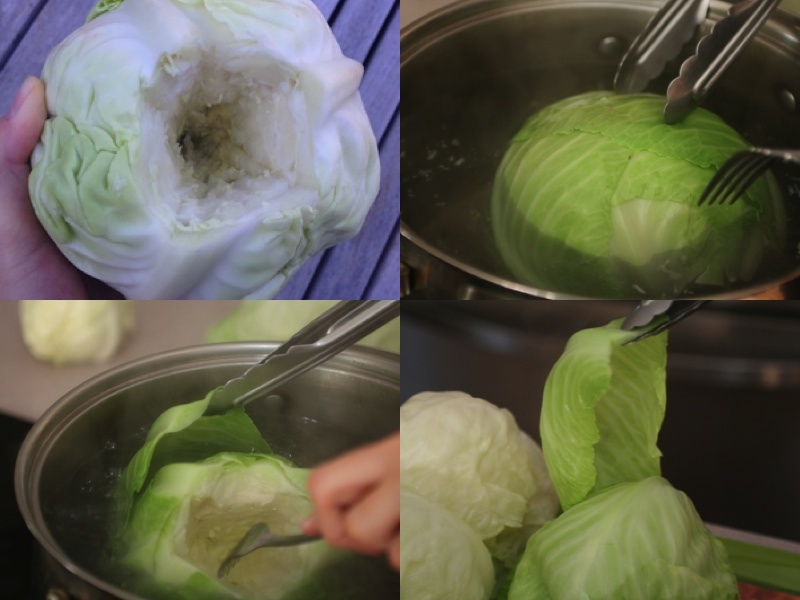 Carve out the core from each head of cabbage, by cutting a circle around the core and going halfway in. Wilt the head of cabbage in boiling water for 5-8 minutes then carefully remove the softened leaves one by one and transfer to a large tray. 7. 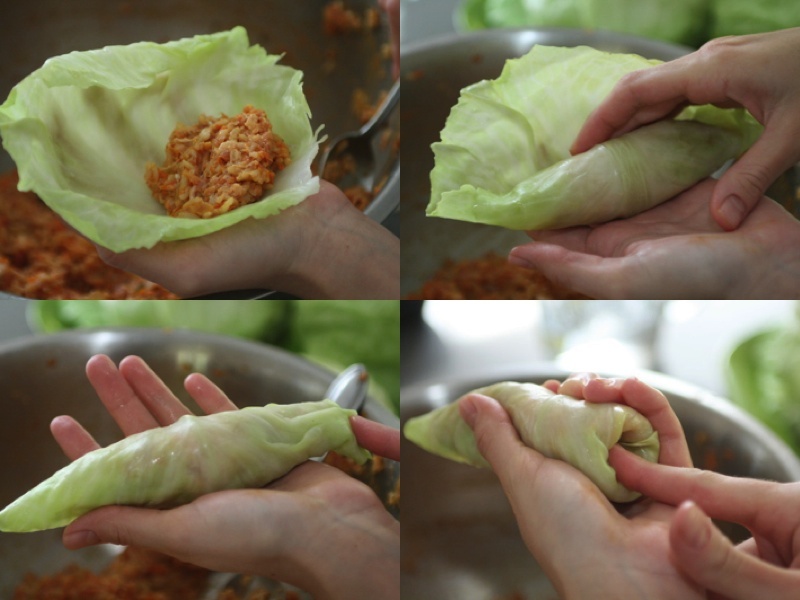 Stuff each softened cabbage leaf with the filling mixture and roll sealing the sides. 8. Stack rolls into a cast iron pot; drizzle a few squirts of ketchup, sprinkle some diced onion pieces and butter slices over the top of each layer. Whisk together the sauce ingredients and pour over cabbage rolls. Bake rolls in a 400 degree F oven for 1 hr then at 350 degrees F for another hour. 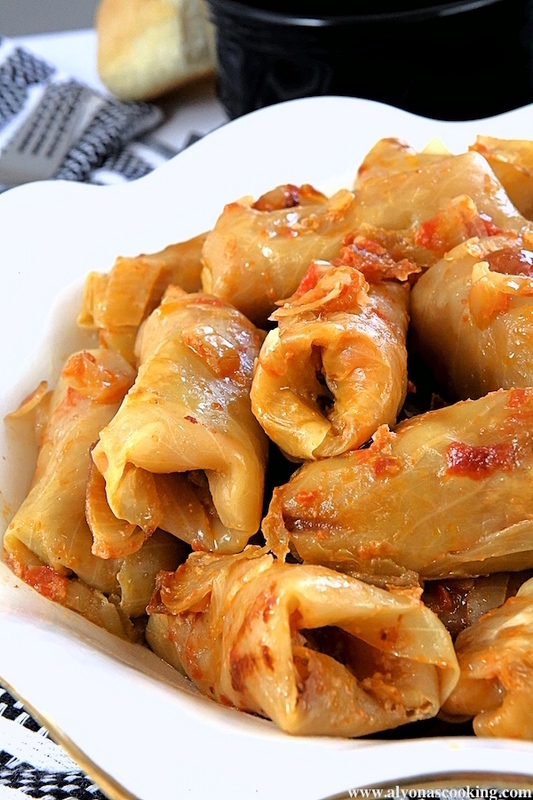 Stuffed Cabbage Rolls is a well-known stuffed cabbage dish in the Slavic culture. Wilted cabbage leaves are stuffed with a meaty rice mixture and baked away to deliciousness. 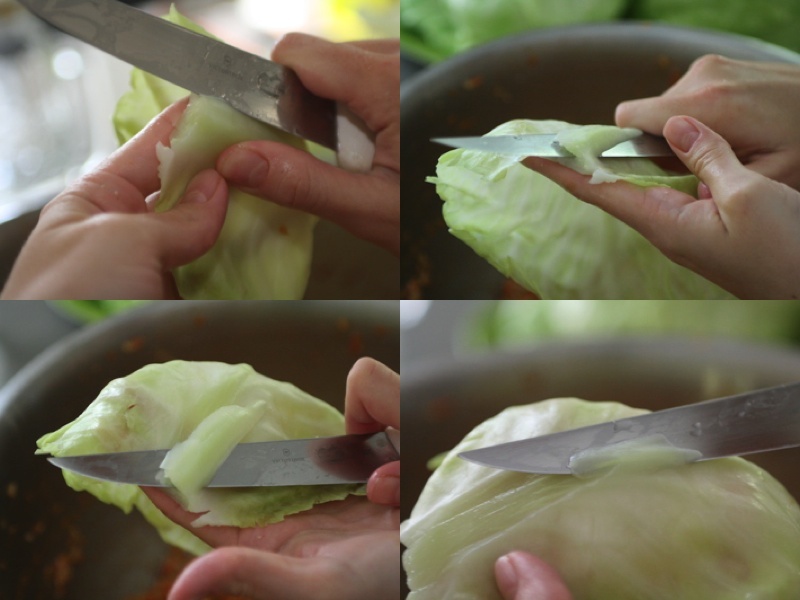 This is my favorite way to make these tasty cabbage rolls. Remove the stem off of the biggest leaves and just lightly slice off the top of the stem of the smaller leaves. 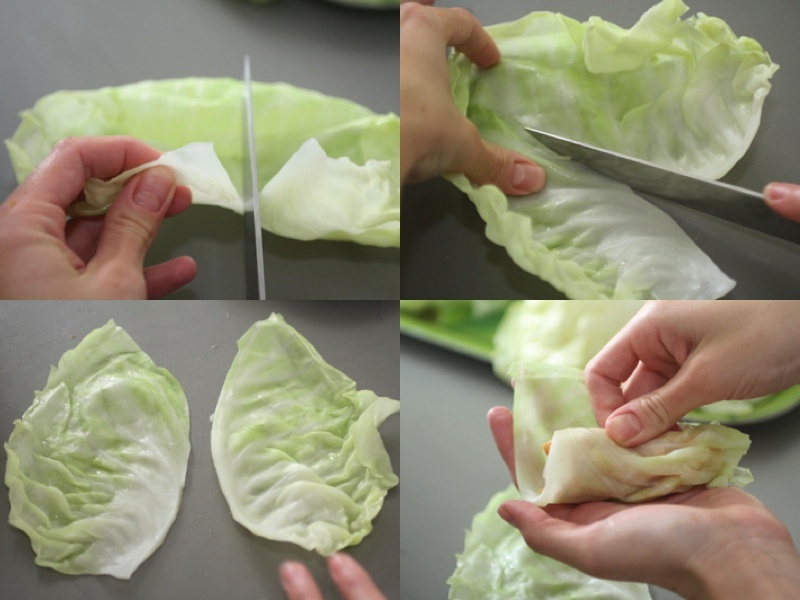 Stuff each softened cabbage leaf with the filling mixture and roll sealing the sides. Stack rolls into a cast iron pot; drizzle a few squirts of ketchup, sprinkle some diced onion pieces and butter slices over the top of each layer. Whisk together the sauce ingredients and pour over cabbage rolls. Bake rolls in a 400 degree F oven for 1 hr then at 350 degrees F for another hour and a half. Had them today for lunch, and they were so good that I decided to leave a comment. 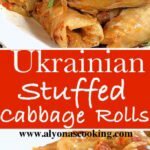 I have tried a lot of cabbage rolls in my life, and these are the best that I have tried so far. They remind me very much of how my mom used to make them when I was a child. Thank you very much! You bake these covered, right? Yes, the cabbage rolls should be covered when baking.